Norman Millar and Judith Sheine designed the built-ins in the living-dining area of their home in the Sea Ranch enclave in Northern California. They were made from vertical-grain Douglas fir. Vintage Dutch industrial chairs are arranged around a black walnut dining table that, like the madrone coffee table, is by Urban Hardwoods. Sofie Howard recruited Commune designer Steven Johanknecht to outfit her Malibu trailer. He introduced custom built-in daybeds with storage beneath; more built-ins flank the small window. The carpet-fragment pillows are from Commune, as is the table, designed by Joshua Tree–based sculptor Alma Allen. The poster is by Mike Mills. The living room of Rudolph Schindler's 1925 How House, featuring built-ins and lamps designed by the architect. Photo by Jessie Askinazi. At architect Ray Kappe's home in Los Angeles, built-ins abound and include a perfectly sized sleeping nook. In his Portland home, Ty Milford peruses a book near the George Nelson–inspired built-ins fabricated by Big Branch Woodworking. 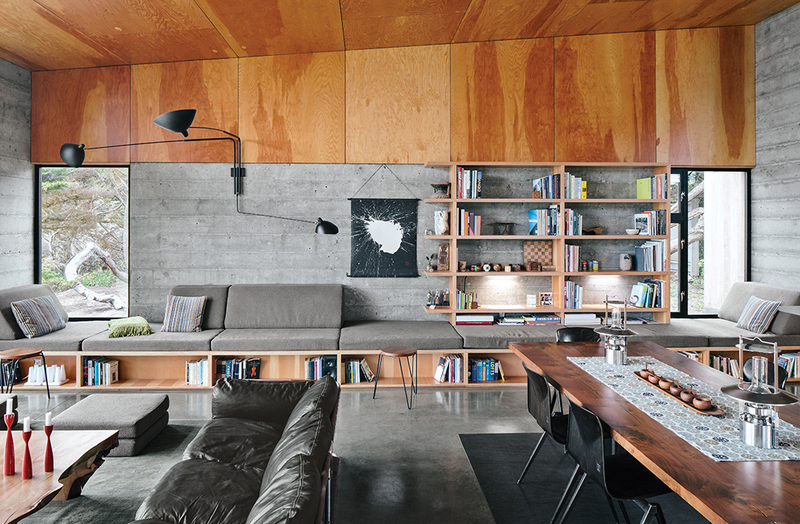 A concrete-block wall and a built-in bench line the living room of a midcentury house in Napa, California, where a photo by Robbins and a painting by Barry McGee hang near a Catenary chair by George Nelson. Custom woodwork, built-ins, and an open interior define a 520-square-foot backyard retreat in Portland. A couch—upholstered by local firm Revive Upholstery & Design—slides out on hidden casters and transforms into a full-size bed (with the headboard doubling as a linen cupboard) where guests can sleep. The Anderson Remodel in Washington State by Shed Architects. Custom cabinetry by Kerf Design. Photos courtesy of the architects. In a family's Copenhagen townhouse, custom details like this corner bed with built-in shelving keep the younger generation’s spaces playful, but still sophisticated. With four children, utilizing space wisely became a top priority, and the family relies on custom shelving and built-ins to keep clutter at bay. The bed is custom with IKEA frames. In Oakland, California, two designers transformed a 100-year-old barn into a (very) cozy home of their own by redefining the functionality of walls and windowsills. Plywood built-ins help control clutter.